Each of our Barrington Coffee Origin CertifiedTM coffees arrives at our Roastery after having been certified at origin by a formally recognized third party certifier as having been produced without the use of pesticides, herbicides, or synthetic fertilizers. In addition to having been certified at origin by a recognized organic certifier, some coffees may bear additional third party certifications from organizations such as Rainforest Alliance, Demeter, TransFair USA, Smithsonian Institution, Utz Kapeh and others. Please consult the description for each coffee on our menu to learn more about its distinct identity. Barrington Coffee Roasting Company, Inc. was among the very first specialty coffee roasting companies in the US to be certified for organic coffee processing. Our certification as a processor began in 1996 and predates our certification through the National Organic Program by seven years. We have been ardent supporters of organic and biodynamic coffee cultivation since we started our roasting company in 1993. During our earliest days roasting, we began sourcing coffees from certified organic coffee growing cooperatives in the Dominican Republic, Peru, Mexico, Guatemala and Sumatra. As Timor established its independence in 1999, we have had the good fortune to work with there as well. Our deep roots in organic agriculture qualify us as one of the longest term certified organic specialty coffee roasters in the United States. 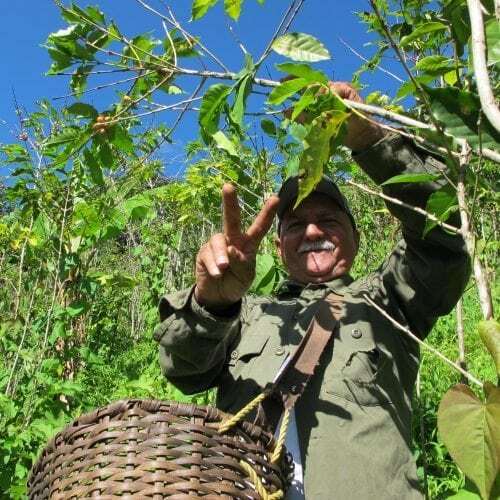 In the mid 90’s we became involved with a biodynamic coffee farming project in the mountains of the Dominican Republic. This was a project inspired by Christoph Meier, one of the founders of the Hawthorne Valley Farm, Ghent, NY. Christoph Meier is a pioneer of biodynamic tropical agriculture and currently operates his biodynamic banana and mango farm, Horizontes Organicos in Azua, Dominican Republic. Our path to organic certification began in 1996 with Quality Assurance International (QAI). At that time we undertook a pro bono consulting project to assist the largest organics company in Europe, Rapunzel Pure Organics, to build a roasted coffee program here in the United States. This project involved work with a coffee cooperative in Chiapas, Mexico. This farm was both organic certified as well as biodynamic certified through Demeter International. Our work with the very same coffee cooperative in Chiapas, Mexico laid the foundation for the coffee program at the Arbor Day Foundation. This was another pro bono project which we initially consulted with the Arbor Day Foundation and helped to get off the ground with Matthew Quinlan at Conservation International (CI). When the USDA National Organic Program (NOP) came into existence in 2002, we became certified as an NOP Organic Processor through the federal program working with Baystate Organic Certifiers, Winchendon, MA. In 2015 we came to the realization that through the efforts we undertake with such a broad diversity of farms and cooperatives of all shapes and sizes, we are able to do an even more effective job at categorically describing our coffees through our own certification program. Thus was born the Barrington Coffee Origin CertifiedTM Program. The processing methods we utilize at our coffee Roastery have always been found in utmost compliance with the guidelines set forth by the USDA and the FDA. Our methods remain unchanged and are driven by the pursuit of sourcing and preparing the finest roasted-to-order coffees on the planet and delivering them to you — FRESH. To make that happen, we fire up our roasters Monday through Thursday of each week. Any order received before 9am will be roasted and shipped out that very same day. We strongly support farming without the use of pesticides, herbicides, synthetic fertilizers and fungicides. We believe that coffee grown under the shade of a tree canopy and polyculture farming practices foster biodiversity, more resilient farm systems, a healthier planet and the highest quality coffee.